I didn't actually plan to install iZen Garden by Random Ideas, LLC (random-ideas.net), even though I like the company name (which is almost as good as Made With Bananas, another phone software developer), but I couldn't resist the reviews. Reviews that begin with, "Out of all the Zen Garden applications, this is clearly the most thorough..."
Out of all the Zen Garden applications??? There has been a world of zen garden applications out there that I simply have been unaware of until now? Gosh. The Apple iPhone is good at being a phone. It is good at being a music player. It is good at video games. It makes for a rather fine, low MP camera. It plays movies reasonably well. It is a calculator. It can find your location on a map using cell tower triangulation. Having achieved all of those things, what is the next step? Weirdness. Weirdness is the next step. One of the lighthearted, applications-without-business-purposes is Koi Pond from The Blimp Pilots (theblimppilots.com). It allows you to watch virtual koi in a virtual koi pond. Something which you likely had not realized that your "smart phone" could do for you. A designer showed it to me at a party, along with a bubble wrap popping simulator. I am running Koi Pond version 2.0 which has such improvements as "refracting koi" and "3d sound." As someone who mainly uses her phone to track buses, post haiku, photo blog, and check messages, it would never have occurred to me to even look for an app like this. But there is something appealing about the total frivolity of it. In the garden as fall approaches. It has been an especially wet, dark, foggy summer here the Ingleside neighborhood of San Francisco. Most mornings when I leave the house for work, the front steps and the street are as wet as if it had rained at night. The constant dampness has been hard on some of the plants. In our sheltered garden, fuzzy plants like lamb's ear and its friend, big ears (both stachys byzantina), are growing mildew on their soft leaves. This is the sort of dampness that prevents us from growing zucchini and basil, whose stems just rot before the plant can thrive. 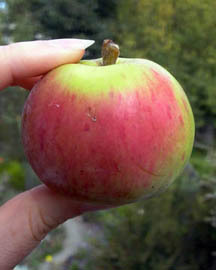 Our apple tree, which blossomed more heavily this year than it has since we moved in, hasn't minded the constant moisture, and its branches are now heavy with red and green apples, which remind me of gravensteins with a slightly tart edge. The first apple that Steven collected, which is smaller than most of the others on our kitchen counter, is pictured here. Our small lemon tree, which worked up the energy on its tiny stems to give us a wonderful lemon last year, is feeling more confident in its fuller shrubbiness, and just provided us with another tasty lemon, also pictured here. I'm suffering from asthmatic bronchitis right now, something that occurs periodically after a fit of sinus allergies, and Steven made me a delicious honey-and-lemon hot drink with the lemon to make me feel better. (Mmmmm, hot honey-lemon!) It helped quite a bit, and was very tasty. 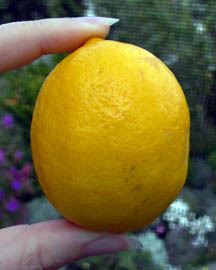 It will be wonderful to have fresh lemons regularly, as we did when we lived in a rented house in San Bruno, where a mature lemon tree scented the air with its blossoms and fruit for most of the year. With so much fog, many of the hints of the approaching change in seasons are hidden. I can't really tell where the sun is rising. Through our rear window, the views of our neighbor's homes work as a sort of sundial: in winter, the sun rises behind the strange blue addition atop the roof of a house a few doors up, and in summer it rises just left/north of the giant fir tree that the birds and raccoons love so much. In recent weeks, the sunrise has been to vaguely defined to be certain, but the feeling in the air is fall. Fall is San Francisco's most beautiful time of year. Not so much because of fall foliage colors, which come a bit late to us and are limited to our Japanese maples, plums, and sycamores, which don't turn colors are precisely the same time. (Most of our trees here are evergreen.) September and October are when we get some of our warmest, most beautiful weather. Especially at night, when the sky is clear, the air is nearly still, and the city lights are sparkling, the City becomes completely irresistible.